Classroom and radio teacher working together. A mission-driven non-profit social enterprise, Lifeline Energy designs, manufactures and distributes solar-powered and wind-up MP3 players and radios for classroom and community listening. No one does what we do. Our technology goes where others can’t or don’t. Imagine a school. One classroom. No electricity. Many children; all different ages. No trained teacher. Then imagine a Lifeplayer MP3-radio, loaded with hundreds of hours of fun, interactive school lessons. Able to tune into the radio and directly record programmes. Or record children’s voices. Powered by the sun. Our media players and radios provide education access to children, teach mothers how give the best nutrition for the children, help farmers increase yields and deliver support to displaced families. Since 1999, more than 600,000 solar and wind-up MP3 players and radios have been distributed throughout sub-Saharan Africa and beyond reaching many millions of listeners. Each unit benefits an average of 40 listeners. However, given the huge class sizes in many African countries, that number could twice as high. Why Solar Radios or MP3s for Learning? Despite increased cell phone and internet coverage in sub-Saharan Africa, radio remains the primary means of communication. Different technologies are used for different purposes. Radio (or MP3) remains the most effective and cost effective say to reach under-served areas with high quality content. Scarce or non-existent electricity in rural areas, coupled with the ongoing high cost of batteries, make radios too costly for the poorest, especially for women. That means people miss out on important information and education programmes that are created to benefit them. When that happens, people end up making critical choices and decisions (about their crops, their health or their finances) by guessing. Audio learning, whether by radio or MP3 helps learners develop concentration and listening skills. Education is the key to a nation’s future. It is fundamental to every person’s confidence and self-esteem. While achieving universal access to primary education is a Sustainable Development Goal (SDG), millions of children in developing countries don’t attend school regularly, or at all. Girls are less likely to attend school and stay in school than boys. 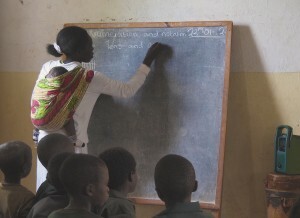 In Africa women make up more than 65% of the continent’s adult illiterate population. Poverty robs many adults of opportunities to gain knowledge and practical know-how. A radio or MP3-based education can bridge that gap. Our MP3s and radios provide 24/7 learning access anytime, anywhere. Our products are fit-for-purpose for use in harsh environments and by users with limited exposure to technology. We also often include solar lights with education initiatives to ensure that teachers and learners alike can see safely at night and extend their productive hours to work after dark. Lifeline Energy is a fund-seeking 501 (c) (3) US charity and a Section 18A and 21 South African public benefit organsation which relies on contributions from individuals, family foundations, corporate funding, institutions and government-sponsored programmes. We collaborate with international relief organisations, in-country NGO partners, business and UN agencies to implement education and information projects and respond to humanitarian emergencies. In 2010 Lifeline Technologies Trading Ltd, a for-profit new product development and trading company that designs and manufactures the products we use in our projects became operational. Lifeline Energy is the majority shareholder. It’s a unique hybrid business structure with Lifeline Technology’s profits accruing to the charity to provide a revenue stream.